Giveaway winners: Linda Walker and Sandra Denton. A wise pastor once told me to pay attention to the markers, the landmarks, that God has used in my life. That there are moments splashed against infinity that would forever alter who I am and what God wanted to do in my life. He reminded me that those moments aren’t necessarily the unforgettable ones and certainly not always the happy ones. Over six years ago, I started praying for the chance to write full-time. I will admit that when I started praying for this, my doubt level was high. I knew what it took to keep a household of four running, and with a husband in ministry, a two-income household is practically required. I told Keith of my desire, so we made a promise that by the time I was 40-years-old, my career would consist of writing, writing, and writing. I’m living my 40th year and today I sit with my computer doing exactly what I had prayed about six years ago. The funny part is that I write from a country thousands of miles from home — definitely not what I had planned when I uttered that prayer. But that’s how God works — He hears our prayers, sets about answering it, but rarely in the way we think it will be answered. I could produce a long list of prayers prayed and answered over the years. If we analyzed exactly how I thought they would be answered or how I thought they should be answered, I would have been wrong every time. 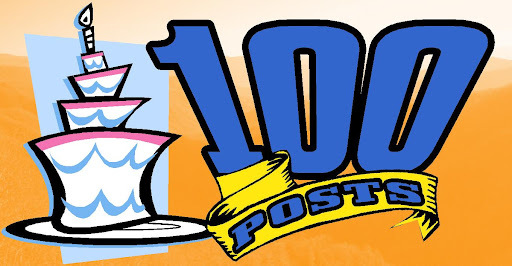 Today is a landmark of sorts: this post marks my 100th. While this might seem minimal, it should actually be much higher by now. I started my blog in May of 2008. That means I’ve averaged 25 post per year (a sad statistic). I remember checking the number of posts earlier in my blogging career and wondered if I would ever reach 100, or if I even had enough interesting topics to write 100 posts. God knew I would and he knew exactly where I would write my 100th –from a kitchen table in the middle of the Ecuadorian jungle. I will celebrate today, not that I’ve reached a blogging milestone, but that God answers prayer. That God honors a heart the wants to use its gifts and talents for Him. I will celebrate the landmarks of God’s constant presence in my life. May you take a moment today and ponder on the moments of your life that have sparked a new course and hurled you toward living all that God has planned for you. May you delight in the prayers that he is answered and smile expectantly at the ones he has yet to answer. Join in on the celebration! a $25 iTunes gift card. To enter, simply leave a comment mentioning your favorite book of all time. (It is the Wednesday Reads edition:) If you don’t have a favorite book, leave a note about what you had for breakfast. For another chance to win, tweet about this blog, making sure to mention @aliciachall so that I know you did it. You can also put a link on your Facebook page for a chance to win. Again be sure to tag me in the update. Finally, refer a friend to the blog. Just have them leave their comment and mention that they were sent by you. Entries close Sunday @ 12:00 PM EST. So very thankful for each and everyone of you who take time to read the blog. I’ll keep writing. You keep visiting. Thanks again! This entry was posted in dreams, Faith Builders, setting goals, Writing on July 11, 2012 by aliciachall28. I love your writing, Alicia. You are my favorite writer in fact. But since you don;t have a book out yet, I'll say that my favorite book is one that you gave me, Redeeming Love. A good friend of mine told me that reading fiction makes you smarter so I've been reading Christian fiction books ever since and I'm hooked (not sure if I'm any smarter though)! LOL! Love you, girl!!! Keep up the good work!